Some movies make me wonder how those involved could get it so wrong. Man of Steel is one of those movies. There are so many things wrong with this film, it’s hard to pinpoint exactly where it went off the rails, but I can boil down its main problem. It’s not fun. This film’s ultra-serious tone drags the already poorly-paced film to a halt. Suffice it to say, Man of Steel is a disappointing addition to the Superman legacy. 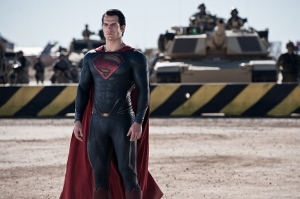 Man of Steel is kind of a mash-up between 1978’s Superman and 1980’s Superman II. Basically we get another take on how Superman came to be on Earth, with General Zod as the main villain. As much I was not all that excited about seeing another origin story, I thought they did a pretty good job of creating a different take on Superman’s Kryptonian beginnings. Krypton looks like a technologically advanced Roman Empire. Like the Roman Empire, Krypton is doomed. Jor-El (Russell Crowe) and his wife Lara (Ayelet Zurer) launch their newborn son Kal-El out into space in a little capsule toward Earth in an effort to save his life and preserve their Kryptonian legacy. Thirty years later Kal-El, now christened Clark Kent (Henry Cavill) by his adoptive Earth parents, is a drifter. Clark is unable to hold a job for long because he has a hard time hiding his super-abilities from his co-workers. As soon as someone starts to figure out he’s not quite normal, he moves on to a new town and a new name. I liked this idea that Clark began his adulthood as a loner and a misfit. He hasn’t figured out what to do with his superpowers and he doesn’t seem to fit in anywhere. His childhood is told through a series of flashbacks, injected at random times throughout the movie. Some of these flashbacks are kind of interesting, particularly as young Clark tries to adjust to his extraordinary strength and x-ray vision. The problem with the flashbacks is that there are so many of them, they interfere with the flow of the rest of the story. The movie basically goes from lengthy, non-linear introduction to excrutiatingly prolonged climatic ending with no real story building. The relationship between Lois Lane (Amy Adams) and Clark doesn’t even make any sense. They barely know each other, yet we’re asked to believe they have some deep relationship where they will do basically anything for each other. Lane is a Pulitzer Prize-winning journalist. Her investigations eventually lead her to the pursuit of the mysterious Clark Kent. After one brief conversation she has pledged her loyalty to Clark, though she could be breaking the biggest story the world has ever known. Well, it would have been the biggest story before the appearance of General Zod (Michael Shannon). Zod and his crew also escaped Krypton and spent the last 30 years searching for them. None of them have aged a day since we last saw them on Krypton, but I guess space travel is tricky that way. Zod wants to find Clark because Jor-El apparently sent along the entire Kryptonian genetic code with his son. Zod wants to find that and terraform Earth into a new Krypton. This is not a bad idea, but it takes most of the movie to get to it. And you know what? During that whole time there is no Superman. 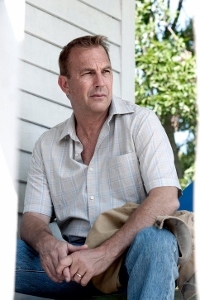 Because Clark’s adoptive father Jonathan (Kevin Costner) told him to keep his abilities secret, Clark has spent his entire life trying to be a normal person. Intended as a bold new start for the Superman saga, Man of Steel is ultimately a needlessly pretentious mess of half-baked ideas and tiresome special effects sequences. Director Zack Snyder and screenwriter David S. Goyer strive to present Kal-El as a Christ-like savior. Jor-El pontificates that the people of Earth will worship Kal as a God while he inspires them to lead better lives. All I saw was a demolition derby in Metropolis (with some ill-advised, heavy-handed 9/11 imagery). As Superman and Zod fight endlessly, Lois manages to show up wherever they are (even though they are covering many square miles). Countless innocent bystanders must certainly die during this battle (the solution to which turns out to be mind-bogglingly simple, by the way). Yet Superman and Lois take time for an unearned, passionless kiss amidst the rubble even before the day has been saved. Cavill can’t really be blamed as the writing gives him little to work with, but he doesn’t exhibit much natural charisma. As Zod, Shannon goes completely over the top, snarling, growling, and yelling his way through an entirely predictable performance. 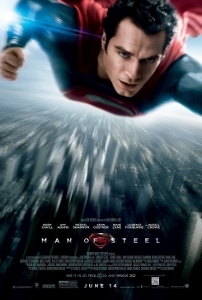 The involvement of Christopher Nolan (credited as a co-producer and co-story creator) led many to believe Man of Steel would be a Dark Knight-style reinvention of the Superman saga. What those Batman film had that Man of Steel is missing is nimble, compelling storytelling (not to mention a sense of humor). Several of my friends have seen “Man of Steel”. Most of their reviews were the same. Loved the first hour of the movie, then spent the last hour deciding if to walk out. In many ways, this is the strongest Superman reboot for a long time. Yet the story manages to be both rushed and overlong, and Snyder doesn’t know when to say stop.